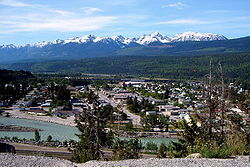 Golden is a town in southeastern British Columbia, Canada, located 262 kilometres (163 mi) west of Calgary, Alberta and 713 kilometres (443 mi) east of Vancouver. Much of the town's history is tied into the Canadian Pacific Railway and the logging industry. Today, the town's economy still relies heavily on those two influences, but the development of Kicking Horse Mountain Resort, along with other outdoor adventure companies, has allowed the town to diversify into tourism. Mount 7, which is just southeast of town, is popular with paragliding, hang gliding, and mountain biking enthusiasts. The town forms part of the Golden Triangle cycle route. 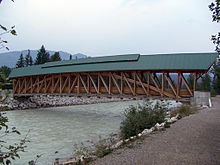 Kicking Horse Pedestrian Bridge is the longest freestanding timber frame bridge in Canada. Planned as a community project by the Timber Framers Guild, volunteers from Golden were joined by carpenters and timber framers from the United States and from Europe. The bridge structure is 150 feet (46 m) long, with a 210,000-pound Burr arch structure. The bridge was completed in September 2001. On March 26, 2009, then-Mayor Aman Virk died suddenly of complications after suffering a heart attack while vacationing in India. Golden is nestled in the Rocky Mountain Trench, built around the confluence of the Columbia and Kicking Horse rivers, surrounded by three different mountain ranges (most notably the Purcell Mountains and Rocky Mountains) and five National Parks: Yoho National Park, Banff National Park, Jasper National Park, Glacier National Park, and Kootenay National Park. Golden is located on Highway 1 (the Trans-Canada Highway) and it is the northern terminus of Highway 95, connecting it to the United States via the rest of the East Kootenay region and the city of Cranbrook, British Columbia (B.C. Highway 95 is a continuation of U.S. Route 95, which runs north-to-south through the U.S. and into Mexico). The Trans-Canada Highway east of Golden has numerous upgrade projects ongoing to greatly improve the roadway west of the Yoho National Park boundary. The Ten Mile Hill section of the project was recently completed and represents a major upgrade to the old highway. Golden has a climate with influences of the humid continental and semi-arid varieties. Summers are warm but rarely hot, with winters being somewhat moderated in comparison to areas east of the Rockies. Golden has a service-based economy, relying heavily on tourism and services for tourists. Unlike many other Canadian towns with similar population size, Golden boasts nine automobile repair shops that all offer a wide range of services and are open extended hours. Golden also features a large number of hotels with mountain views that provide accommodation to both tourists and stranded drivers. Public education is provided by School District 6 Rocky Mountain which operates 3 primary schools and one secondary school. Community College education is offered by the Golden Campus of the College of the Rockies. ^ "Kicking Horse Pedestrian Bridge". Tourism Golden. Archived from the original on 2008-11-21. Retrieved 2008-08-21. ^ "Golden Mayor dies at 39". Black Press. Archived from the original on March 30, 2009. Retrieved 2009-03-26. ^ "Calculation Information for 1981 to 2010 Canadian Normals Data". Environment Canada. Archived from the original on February 14, 2014. Retrieved July 9, 2013. 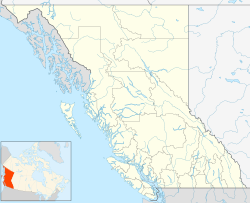 Wikimedia Commons has media related to Golden, British Columbia. Wikivoyage has a travel guide for Golden, British Columbia. This page was last edited on 1 October 2018, at 11:01 (UTC).